It’s been a rough week, folks. Hurricane Sandy slammed the East Coast on Monday evening, leaving devastation and tragedy in her wake. With the cleanup in full swing and power out for much of the east coast, it’s hard to think about sharing recipes. Cooking seems a bit trivial in the face of this major storm event. And yet, we have to eat. We literally can’t live without food. The only thing I could think to do is share something warm, cozy, and ultra comforting… an easy dish that can be prepared on a gas stovetop, even while the power is out. 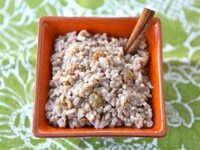 This Coconut Chai Rice Pudding is rich, creamy, and delicious. It’s lightly spiced with a chai blend to give it a warm, aromatic Indian essence. The coconut milk lends creaminess without giving an overpowering coconut flavor. You can add a half teaspoon of coconut extract at the end of cooking to make it more coconutty. It’s mildly sweet, and can be sweetened more to taste. It also happens to be dairy free and gluten free. Rich, cozy comfort food… the best way I know to weather the storm. Consider donating $10 to the Red Cross to help storm victims by texting the word REDCROSS to 90999. You can also donate online here. Note: If you don’t mind making this a dairy dish, feel free to substitute regular milk for almond milk. 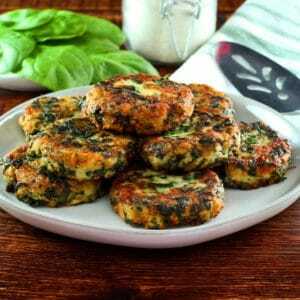 Dairy free recipe made with coconut milk, rice, raisins and spices. Kosher, Pareve, vegetarian, dessert. 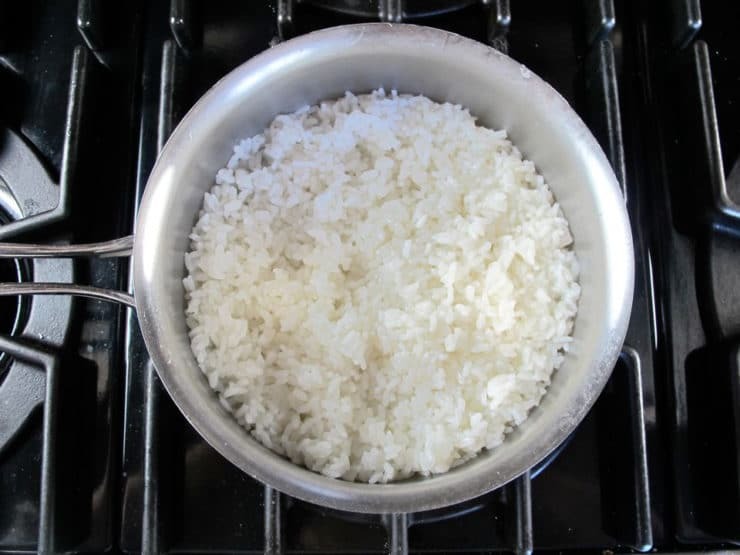 Pour uncooked rice and salt into a small saucepan with 2 cups of water. Bring to a boil on the stovetop. Decrease heat to a low simmer. Let the rice cook for 15-20 minutes till all the water is fully absorbed and the rice is soft. Remove from heat and keep covered. 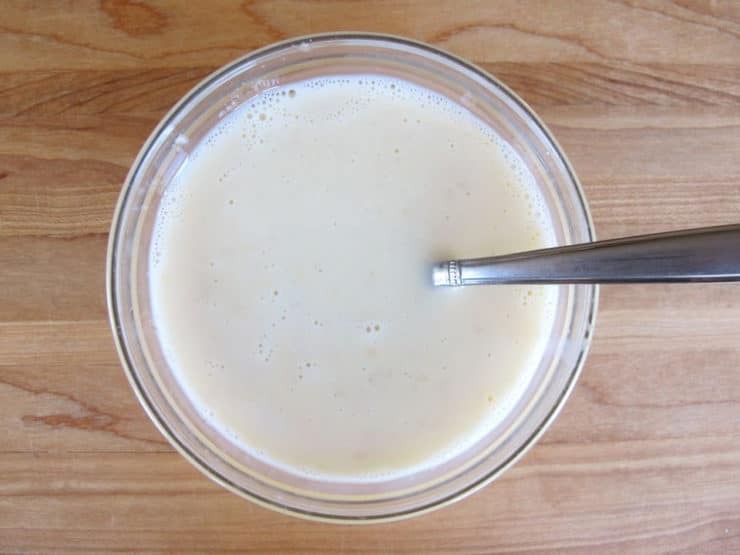 In a separate saucepan, combine 1 cup almond milk, 3/4 cup coconut milk, sugar, and spices. 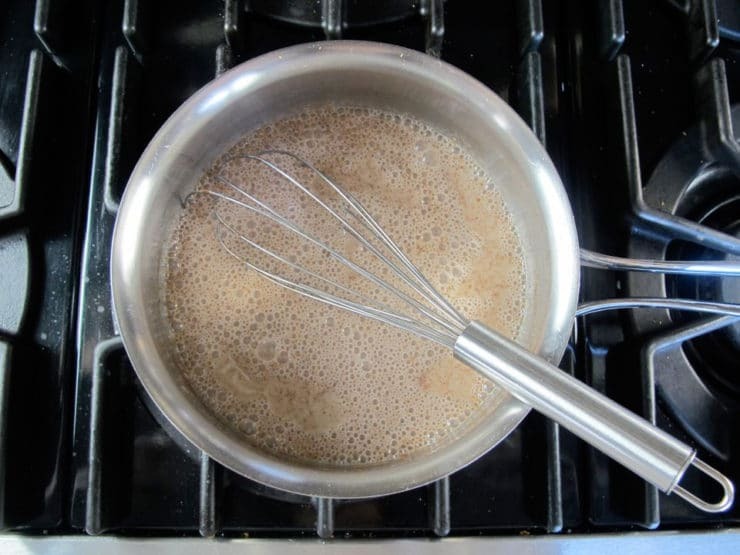 Whisk together over medium low heat till the sugar is fully dissolved and the spices are blended into the milk. Add the cooked rice to the pan and stir. Continue to cook on medium low for about 10 minutes longer, stirring frequently, till the mixture is thickened and creamy. In a small bowl, beat the egg. Add a tablespoon of the hot rice mixture to the beaten egg and stir with a fork till blended. Beat in the remaining 1/2 cup of almond milk with a fork. 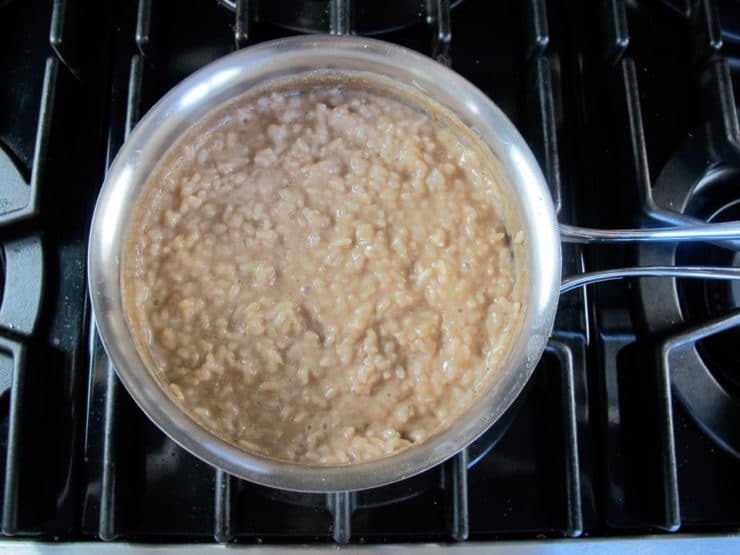 Slowly drizzle the almond milk and egg mixture into the hot rice mixture, stirring constantly, till fully incorporated. 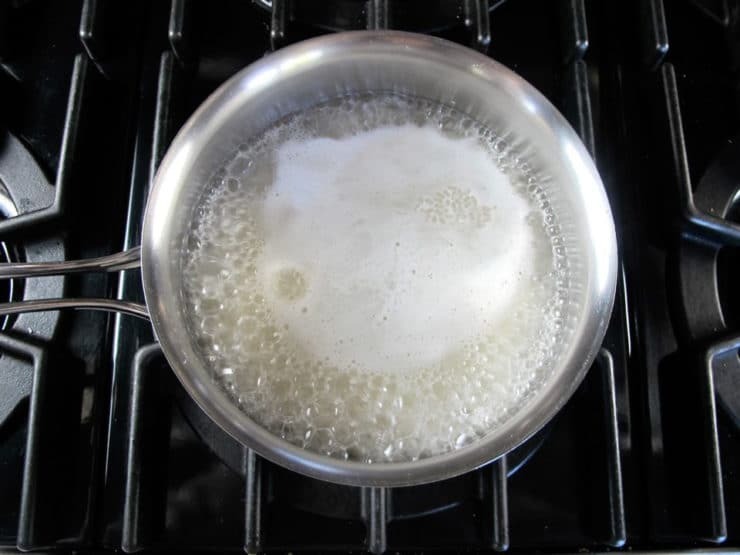 Continue to heat and stir the mixture for about 3 minutes longer, stirring frequently, till the mixture bubbles. Remove from heat. Taste; season with additional sugar, if desired. Serve garnished with a cinnamon stick, if desired. For a more pronounced coconut flavor, you can stir in 1/2 tsp of coconut extract at the end of cooking. The mixture will thicken as it cools. 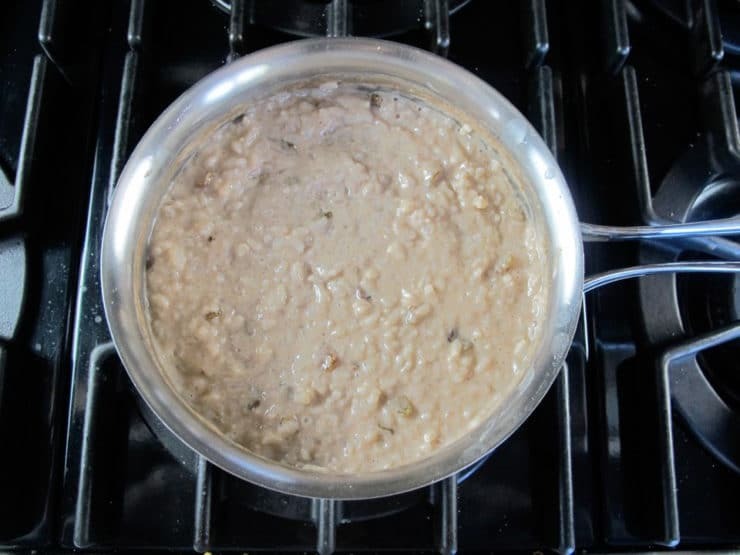 To reheat, add a little almond milk to thin out the mixture as it heats. 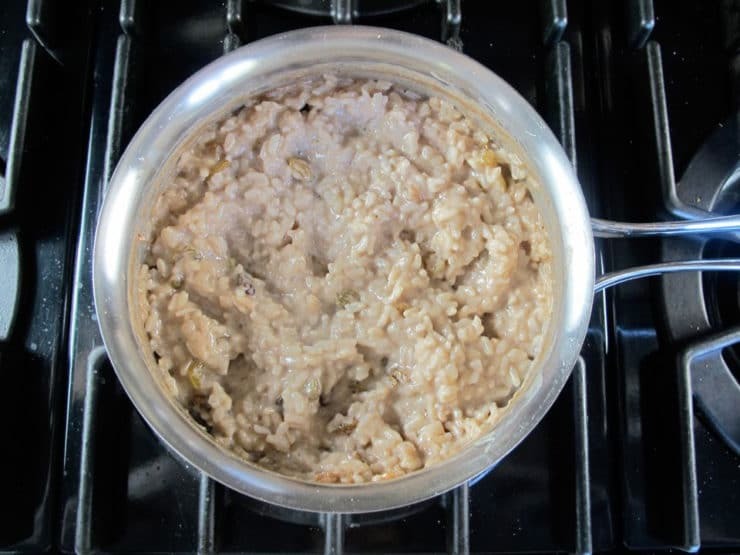 My dairy-free wife did not eat rice pudding for years. I was pleased to find this recipe which she really enjoyed. 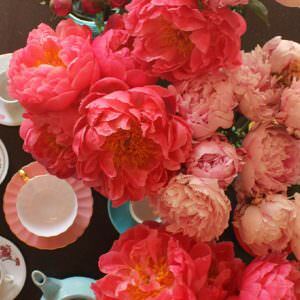 I made the full recipe, gave her a portion and canned the rest in small jam jars. They sit on the pantry shelf and she takes one (or two) down whenever she has the urge. I predict I will need to make this recipe once every two months or so. Hi Tori! 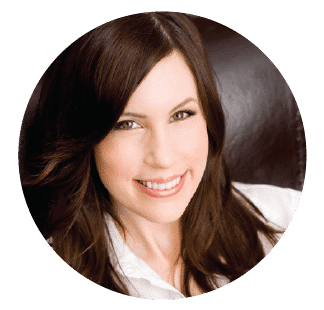 Just discovered your website and I LOVE IT!! I am dying to make the coconut chai rice pudding but can’t have egg. I saw on your reply that you can omit the egg but pudding won’t be as thick. What if I reduced the liquid? Thanks so much! Yes you can try that, no problem! Wow! Yum!! I only had coconut cream, so I mixed it about 1/2 and 1/2 with water. I added dates and hazelnuts because that’s what I had available. So delicious…I might have the leftovers for breakfast! Have just made this dish. Used less sugar as coconut cream makes it so sweet and yummy!!! Perfect dessert on a chilly night. I wanted to know what coconut and other non-dairy milks (brands if possible) you prefer and use. I haven’t tried this recipe yet but everything in your site looks delicious. Hi Patricia– I hesitate to recommend brands here, but I will say I prefer sugar-free non dairy milks to those that contain sugar. If you can find organic, even better! For the coconut milk, I prefer using full fat canned rather than the more mainstream coconut-based milk substitutes. Hi! Does this recipe use canned coconut milk, or carton coconut milk? Hi Anna, Tori’s assistant Ashley here. You can use either in this recipe, but full fat canned coconut milk will give a better coconut flavor. I decided to try to make this for breakfast for the next few days . This is delicious. I used vanilla almond milk, and it added just enough vanilla flavoring. I will definitely be making this again! I made this for a large group of people who absolutely loved it! The coconut milk/almond milk combo works well. Make sure you use unsweetened almond milk or else it will turn out too sweet. I also added a bit of vanilla and coconut to it to add a bit of texture and flavour. I also started out by using only 3/4 of the sugar in the recipe and am glad I did this. This is by far the best rice pudding recipe that I’ve come across! I took your advice and added more milk and simmered it for a while. It worked 🙂 it is so creamy and delicious. I am not sharing! Thanks so much. Great! So glad you were able to salvage the pudding. Enjoy! I made this tonight and am disappointed. Not in the recipe, in myself. All I had on hand was brown rice and arborio rice so I used the arborio and it came out crunchy 🙁 I have used this rice when making rice pudding and risotto previously and never had a problem but I guess it just wasn’t cooked long enough. The flavor was amazing though. Will definitely try again with the rice you suggested. I didn’t know it was crunchy til hours later when it was cool and I went to try it. Do you know if there is anyway to recover from this mess up or is it ready for the garbage? So sorry to hear that Tracy! You could try adding a little more liquid and simmering a few more minutes with the lid on, but I’m worried that the egg might curdle. Might be worth a try though. Next time, know that you can use any rice you’d like, but you must cook whichever rice you choose till it’s soft before proceeding with the recipe (some rice may require more water and time to get completely tender). Hope the next batch comes out better! Hey, thanks a lot for this recipe I just finished it and it was delicious, definitely will keep doing this forever lol. I love me some chai tea and I love warm desserts. My family loved it, greetings from México. Any substitutions for the egg? I’m allergic and I don’t think a flax egg would work with rice pudding. Leah, you can just omit the egg. The pudding won’t be quite as thick, but it will still taste amazing. Wonder if I could substitute chai tea latte for the liquid ingredients, skip the spices and end up with a similar result? What do you think? This was delicious! 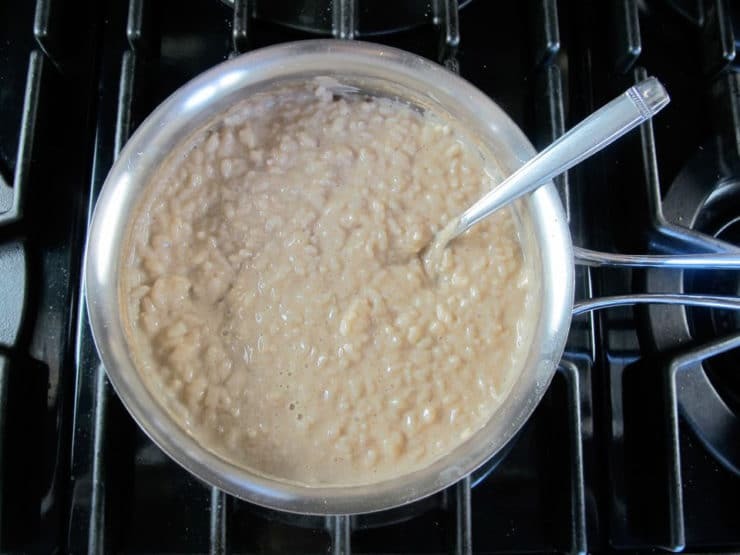 It is the best rice pudding I have ever had, and I have made several varieties. Mazel tov and thank you!!! As we endured the pounding of the storm on Monday evening in NYC, we kept in touch with our virtual community via Facebook. I can’t tell you how many people were cooking and posting about it! I made your “Jacob’s Lentil Stew” from the History Kitchen. My downstairs neighbor baked brownies and brought some up to share. Friends in Brooklyn baked bread — in Staten Island, pizza — Upper West Side, quiche. We literally cooked up a storm! As people lost power, they signed off. Things will take a long time to get back to normal, but thanks for being part of my online comfort food group! That is so cool to hear Nina! Happy to know my recipes helped you all stay cozy in the midst of the crazy weather. Sending positive thoughts to you all, I hope you’re able to return to normal soon! Rice pudding could be the most comforting of desserts. With the warm spices in this rice pudding; it’s like a hug for my tummy!